Students at the University of Geneina, Sudan. Photo by Albert González Farran – UNAMID, used under license CC BY-NC-ND 2.0. 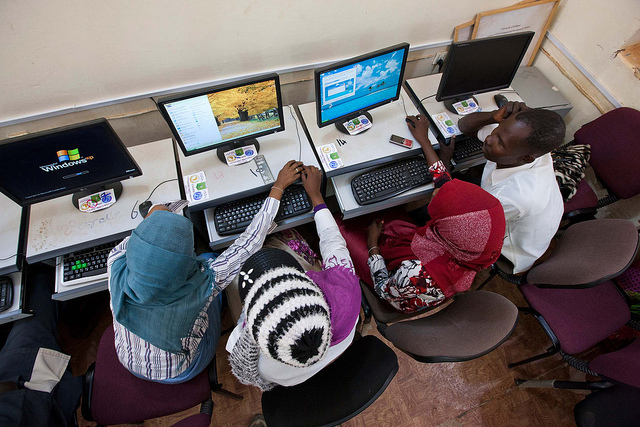 Under the new license, announced on January 17, 2015, Sudanese should be able to have access to, as well as purchase, personal communications technologies they were unable to use under the previous restrictions. This includes smartphones, tablets, laptops, network devices and a plethora of online services like web hosting, mobile app stores, and cloud storage services, among others. The decision follows similar ones taken by the US government towards other sanctioned countries in recent years, including Cuba, Iran, and Syria, that aim to promote freedom of expression by enabling certain communications technologies to reach the citizens of those countries. Sudanese on social media were ecstatic over the news, some joking about bidding VPNs farewell, while others were concerned about ensuring US corporations would comply with the new regulations. A campaign to lift US digital sanctions on Sudan was launched last year by Sudanese activists aimed to shine light on how Sudanese people are affected by US sanctions on digital communications. Journalists, political activists and human rights defenders in Sudan are particularly endangered by the worsening human rights situation in the country. Sudan has occupied the top rankings for violating freedom of expression and press freedom in human rights organizations’ freedom indexes over the past decade. As for internet freedom, Sudan was classified ‘Not Free’ in Freedom House's Freedom on the Net index for 2013 and 2014. While a welcome step in the right direction, the new amendments are still limited in scope and the massive challenges faced by Sudanese citizens remain warranted. Young Sudanese professionals in particular are feeling increasingly isolated and unable to integrate into the global community to pursuit their innovative and entrepreneur aspirations. “We need to push this forward now!”, Mohamed Hashim Kambal, Internet activist and coordinator of the ‘Lift US Digital Santions on Sudan’ campaign told Global Voices via Skype. Kambal cited several examples in which the sanctions still affect Sudanese citizens. “Even under the new general license, young professional engineers and developers cannot get certified by industry-established US and non-US providers and vendors from inside Sudan. Exam and certification centers can't open in Khartoum,” he explained. This has led many of these young professionals to give up on pursing their careers in Sudan, contributing to a reportedly massive exodus of skilled work force. Professionals in the fields of medicine, humanitarian development and peacekeeping face similar obstacles. The US-based Electronic Frontier Foundation has criticized in the past what it described as US government's ‘piecemeal approach’ to the sanctions, arguing that it harms innovation and development in sanctioned countries.